Move on over, canned condensed cream of mushroom soup. We’re flipping the green bean script. Calories aside, I’ve never been a fan of the traditional green bean casserole. I think it’s the unnecessary creaminess brought to otherwise delicious vegetables that turns me off because I feel the same way about creamed spinach and creamed corn, too. Then there’s the sameness of the green bean casserole – every single one has the same ingredients: the canned soup, the canned green beans, the crispy fried onions in a...you guessed it...can. Don’t get me wrong, I’ll eat it. But it’s just not my thing. At this point you're thinking, “how dare someone throw shade at my beloved Thanksgiving companion,” or, “GIRL, ME TOO.” No matter which side you’re on – I set out to create a fresh take on an old classic and I invite you along for the ride. These green beans use caramelized onions, mushrooms, and bone broth to create the base instead of the canned soup. Toss in a little bit of freshly grated parmesan and top with a parmesan-panko crisp, and you’re good to go. All in one pan. *If you’re feeling cheesy, feel free to add as much parmesan as you’d like. And for more crisp, use more parmesan-panko blend on top. In a large cast iron pan, melt one tablespoon butter and one tablespoon olive oil. Add onions, top with the salt (this helps draw out moisture) and cook for about 10 minutes, occasionally stirring until the onions begin to melt down a bit. Add the mushrooms and two sprigs of thyme leaves and cook low and slow for another 15-20 minutes, stirring occasionally. Don't fuss with them too much – we want the mushrooms to have enough time to gain their beautiful caramel color, but stir when needed to keep from burning. Add garlic. Cook for another minute allowing the garlic to release its flavor. Add ¾ cup bone broth and deglaze the pan. Add green beans and cover. Simmer for about 10-15 minutes until tender. About halfway through, add a whole thyme sprig. Remove sprig before next step. Add ¼ cup parmesan and stir to combine evenly. Remove pan from heat. Melt one tablespoon butter. Add ⅓ cup panko crumbs and ¼ cup parmesan and stir to combine. 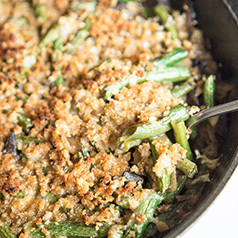 Top green bean dish with the parmesan-panko blend and broil for 1-3 minutes under a watchful eye until crispy light brown. Tip: If you don’t have a cast iron pan, you can prepare in a regular pan, then transfer to an oven-safe dish before crisping in the oven. You can also try making this dish Whole30 compliant by skipping the parmesan, using Ghee instead of butter, and almond meal instead of panko.